Recently there has been considerable interest in micro-structured surfaces since the solid topography affects adhesion and enhances wetting properties of the material. The modelling of spreading droplets on topographically structured substrates is computationally challenging, since it may also involve the possibility of air inclusions and an unknown number of existing contact lines (e.g in the case of hydrophobic material). The talk will describe a novel a sharp-interface scheme which can be used to overcome such difficulties by treating the liquid-gas and liquid-solid interfaces in a unified context without the need of an explicit condition and any requirement for the predefinition of the number and position of the contact lines. We will examine the predictions of the model for a variety of different situations which range from droplet impact, sliding droplet on an inclined plane, thermocapillary droplet migration to droplet actuation through substrate vibrations. It will be shown that the proposed model is able to handle interfacial flows with topological changes, e.g. in the case of an impinging droplet on a structured surface. Then it is possible to predict, depending on the impact velocity, whether the droplet will fully or partially impregnate the structures of the solid, or will result in a ’fakir’, i.e. suspended, state. In the case of sliding droplets the model can also provide a prediction for the effects of static or dynamic contact angle hysteresis. It will be shown that the presence of air inclusions trapped in the micro-structure of a hydrophobic substrate (Cassie-Baxter state) result in the decrease of contact angle hysteresis and in the increase of the droplet migration velocity in line with experimental observations for super-hydrophobic surfaces. Moreover, we will discuss about the conditions under which the presence of asymetrically structured substrates may induce anisotropic wetting properties and set a preferential direction of motion and how the latter can be exploited to transfer droplets, e.g. through substrate vibrations, preferentially in one direction. 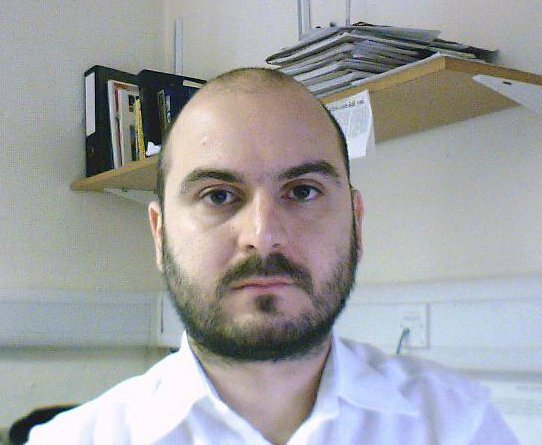 George Karapetsas is a Research Associate in the Department of Chemical Engineering at University of Patras, Greece. He completed his undergraduate studies at Aristotle University of Thessaloniki, Greece and then moved to the University of Patras where he received his Ph.D. in computational fluid mechanics. Following the completion of his Ph.D. he worked as a postdoctoral researcher at Imperial College London. After receiving a research grant from the Greek Ministry of Education he moved back to Greece and worked as a Research Associate at University of Thessaly before moving eventually to University of Patras where he is currently based. His research interests lie in the area of transport phenomena, fluid mechanics and applied mathematics. He is particularly interested in theoretical modelling with special focus on interfacial and multiphase flows, fluids with complex rheology, hydrodynamic stability, surface-tension-driven flows, contact-line problems, and droplet dynamics.